I’m always thrilled when I follow my system of naming fosters (chester + SC town/city/county, alphabetically) AND, in doing so, I get to name the foster after someone. There is a town in SC named Salley. Who knew? And, I just happen to have had a great great Aunt Sally who I adored as a child. So I smile whenever I say Salley’s name. 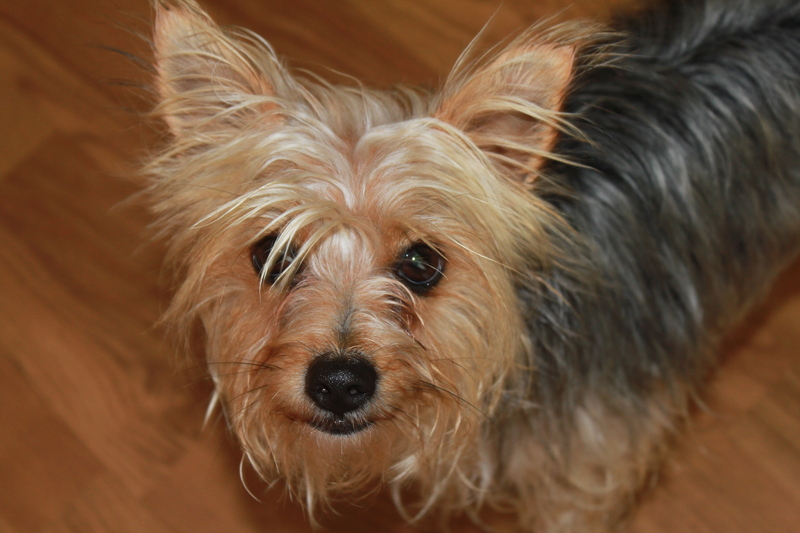 Sweet Salley, a Yorkshire Terrier, was surrendered to our local kill shelter by a couple who had recently birthed a baby. 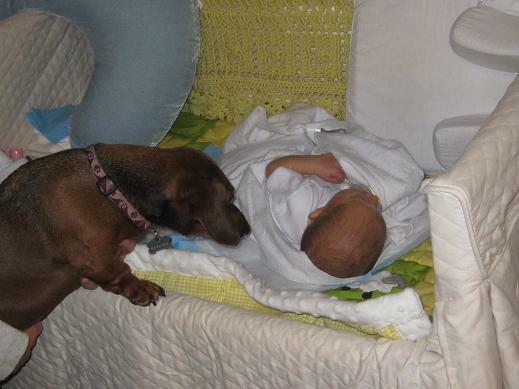 “No dogs around the infant,” they said, “time to give away Miami.” SIGH. — both for the couples’ unwillingness to commit to both pet and infant, and for the name Miami, which doesn’t suit at all. Here’s another photo. I told Salley that her hair was in her eye in the previous photo. So, I brushed it back, and we tried again. Ah well. Salley was terrified in the shelter, and, though she was relieved to walk through my door, she ran from room to room, looking for the owners who had abandoned her. Yet again, an example of a dog showing more devotion than a human. She didn’t find them, but she found Arina, and spent the afternoon curled up on her lap, snuggling. So, I feel sorry for the couples’ child, who has been deprived of a lap warmer. 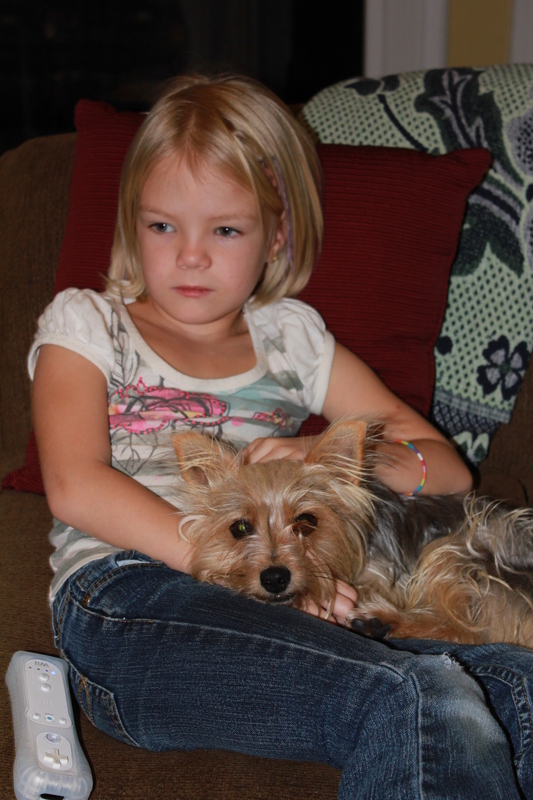 True, infants have no need of lap warmers, but Salley is only 2-3 years, so the child would have grown into her. 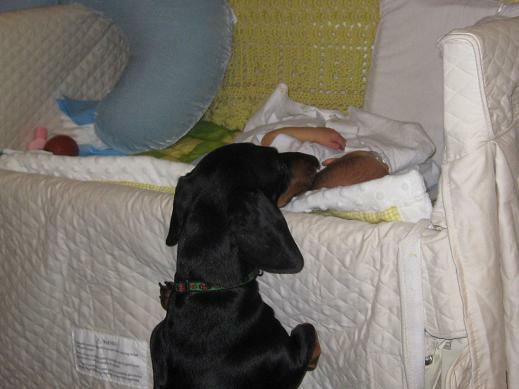 And I’m reminded of the time we introduced our mini-dachshunds, Emma and Mr. Knightley, to Jack. My doula had sent a baby blanket, with Jack’s scent, with my mother, days ahead of our arrival. So they were ready. “Do you want to see the baby?” we asked, on the day we got home from the hospital. They jumped around, excited, seeming to think that “baby” was some kind of treat. — or a new blanket at the least. Knightly, who is taller than Emma, jumped up on his own to sniff and see. Both accepted Jack as a member of the pack immediately, and then they got a dog bone each, proving that babies are treats indeed. And what did Scott say about Salley? He went straight to the backyard when he got home from work, to cut the grass. I walked outside holding her. “Why are you smiling?” he asked. “I’m just so glad you’re not mad at me!” I said. “For what?” he asked, suspiciously. “Um . . . for this,” I said holding out Salley. He confessed that he thought I was holding Lexi, a Norfolk Terrier (also available for adoption) that one of my friends is fostering for me. Scott knows Lexi and knew that we would be puppy-sitting her for a couple of days. Is it just me or do Salley and Lexi look nothing alike? I’m now convinced of what I’ve always suspected: I could have TWICE the number of fosters that I have, as long as the first set looks somewhat similar to the second. Scott will just think he’s seeing the same ones over and over again. 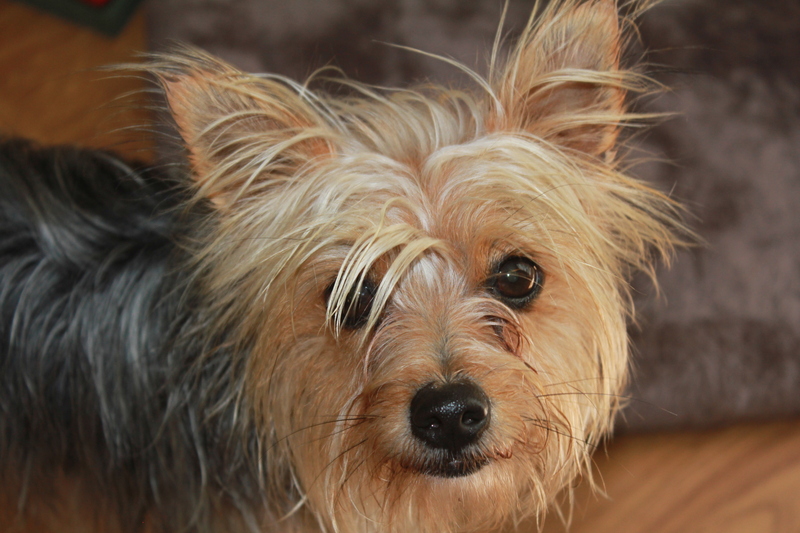 (1) Gertie went to her new home on Thursday. She’s going to be living it up with another 10+ female senior in North Carolina. — the canine version of The Golden Girls. 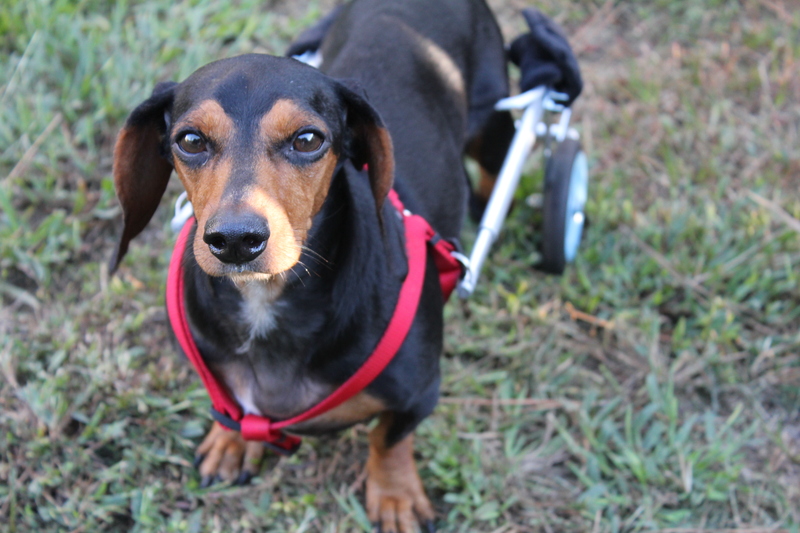 (2) Quinby will be going to her new home with the Dachshund Rescue of North America tomorrow. I’m hoping they’ll make her a therapy dog. (3, 4, 5, 6, 7 and 8 ) And Edisto, Ravenel, and Abbie Faith’s pups will be New York bound this Friday to a fabulous weekend adoption event. *Fingers crossed* for them all; if they don’t find homes this weekend, they’ll go to foster homes in NY and wait for the next big adoption event. 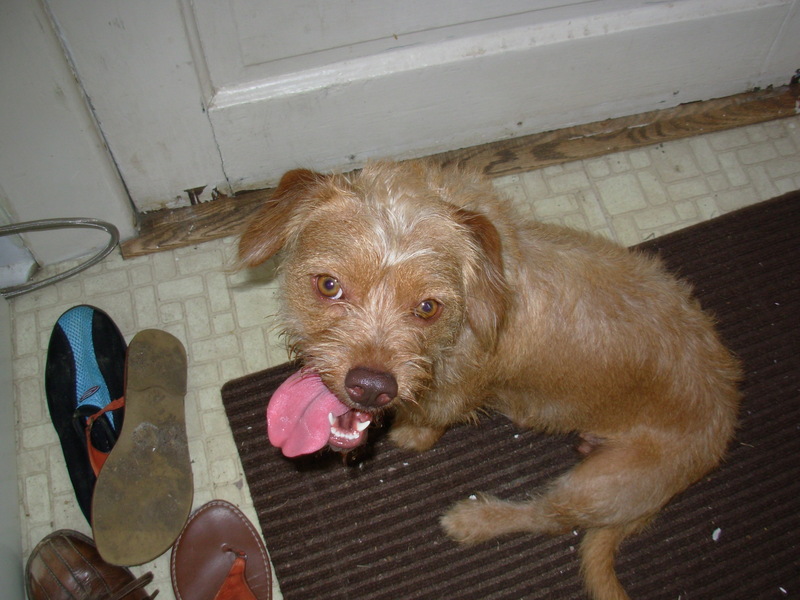 So, really, it’s like I currently had no fosters when I picked up Salley. At least, that’s how I explained it to Scott. And Salley is snuggled up with him as I type, so it must have worked. Let me know if you’d be interested in adopting sweet Salley! She’s up-to-date on vaccinations, spayed and micro-chipped. And, she’s house-trained. She’s great with people of all shapes and sizes, though my friend Lisa, who puppy-sat her briefly, said that she’ll try to be alpha-dog. She started bossing Pepper (previous Fisk foster York) almost as soon as she walked through the door. She has since tried to boss Quinby (below), but quickly realized that she’s no match for a cyborg wiener dog and desisted. Smart girl, Salley. A-Z: Where are they now? Chester PaXville and York: Adopted! Chester2 Olar and Powdersville: Adopted! Chester2 Timmonsville and Union: Adopted! Chester2 Williston and BordeauX: Adopted! Chester2 Yemassee and DalZell: Rescued and Adopted! Chester3 Ariel and Beaufort: Rescued! Chester3 Carlisle and Dewees Island: Rescued and Adopted! Chester3 Edwards and Forest: Rescued and Adopted! Chester3 Gregor and Hazelle: Adopted! 100% of donations go to pulling, vetting, feeding and placing Fisk fosters in forever homes. Thanks for your help!